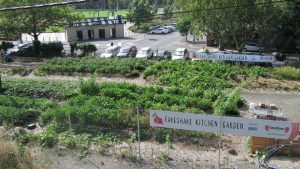 A few weeks ago, a number of us went to the FareShare Open Day, where we were shown around their Abbotsford veggie garden by their Garden Program Manager, Sharni Jansen. 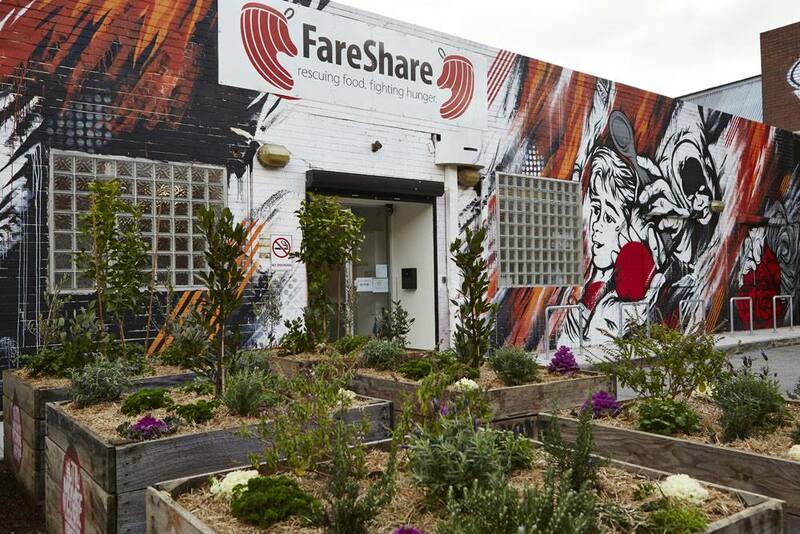 Consequent on this (and long overdue), FareShare have been added to our Local Food Directory in the ‘food justice’ section. Read their Local Food Directory page. FareShare, who are headquartered in Abbotsford, are an amazing organisation. They rescue food that would otherwise go to waste and cook it into free nutritious meals for people in need. In Melbourne, with the help of 900 regular volunteers, they cook around 5,500 free meals a day (i.e. around 1.3 million meals a year) for charities such as soup vans, homeless shelters, women’s refuges and community food banks. Sourcing enough fresh vegetables to add nutrition to meals is one of FareShare’s biggest challenges. It now has three sites in and around Melbourne where it grows its own vegetables, harvesting around 40 tonnes per year. The Abbotsford site comprise 70 beds. Read more. I have arranged with FareShare to be given a tour of their kitchen, on a Monday, Wednesday or Thursday during working hours, and can take up to five other people. If you would like to come, email me. First in, best dressed. This month, Morgan Koegel, General Manager at 3000acres, writes about what our local councils are doing to support local food production. Read more of Morgan’s issues. The results of the great tomato experiment are in! At the start of this warm season, my wife and I set up two identical raised beds for growing tomatoes. Let’s call them ‘neglect’ and ‘nurture’. Each bed had 8 tomato frame cages, with each bed growing the same 8 varieties of tomato. In the ‘neglect’ bed, there were 2 tomato plants per cage, no removal of side shoots, and no bird netting. In the ‘nurture’ bed, there was 1 plant per cage, regular maintenance, bird netting and the quiet singing of sweet lullabies. The question being investigated was the extent to which, in terms of tomato yield, the nurturing would offset the halving of the number of plants. The results were rather different for the different types of tomato. For the large, beafsteak tomatoes, the ‘nurture’ bed yielded more tomatoes, even with half the number of plants, and they were better quality and larger – a major win for the ‘nurture’ bed. For the small tomatoes (say tigerella and below), neglect had less of an effect and the ‘neglect’ bed yielded more (although not twice as many) fruit and of similar quality – a win for ‘neglect’. Finally, for the sauce tomatoes (San Marzano and Roma), many in the ‘neglect’ bed, but none in the ‘nurture’ bed, suffered from blossom end rot – a win for ‘nurture’. So, in conclusion, large beafsteak and sauce tomatoes should both be grown in ‘nurtured’ beds where the plants are widely spaced (i.e. 1 plant per cage). Small tomatoes are more tolerant of ‘neglect’ and close spacing (e.g. 2 plants per cage). Anyone got anything they would like to say about all this? Email me. Interested in events that are free? In response, I’ve added a ‘free event’ category. You can view the resulting calendar of free events by either going to the new free events calendar page on the website or by going to the main calendar page and choosing the ‘free events’ category from the drop down box top left. 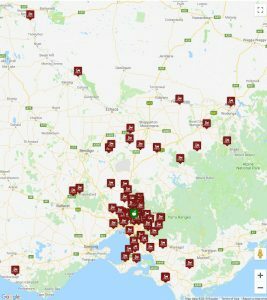 Where do the Eltham Farmers’ Market stallholders come from? Have a look at this map of where each of the 87 Eltham Farmers’ Market stallholders comes from. Jane Dyer, from Backyard Honey in Surrey Hills, writes in: “Melbourne beekeepers may be aware that the hive beetle is becoming more common. One solution to help eradicate hive beetle when packing down your hives for winter is to freeze all the bee frames and boxes planned to be used again next season. Freezing frames and boxes to less than -12C for more than 6 hours will eradicate all stages of small hive beetle and wax moth. If interested, or for more details, email Jane. Steam Weeds, the weed management company. How did the tomato court the sweetcorn? He whispered sweet nothings in her ear. Shared learning day for community food enterprises: Thursday, 11th April, midday-4.45pm; Epping. What: The purpose of this day is to give community food enterprises an opportunity to connect, converse and support one another by sharing their experiences. 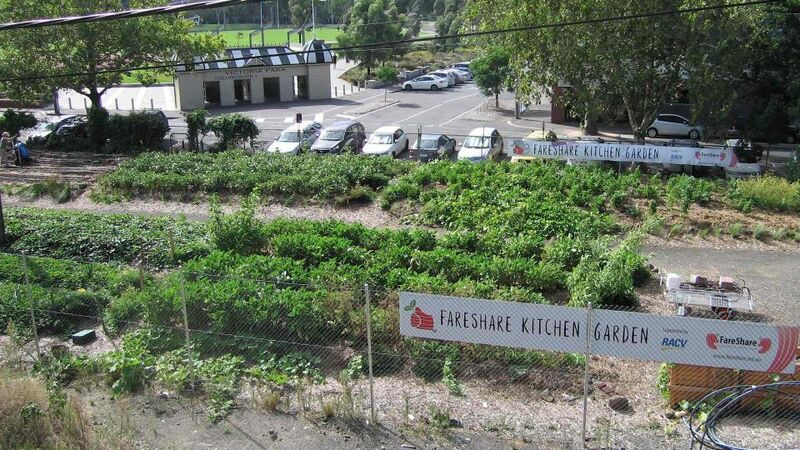 They will also be helping to design systems for a new enterprise – a 90-hectare community farm, with a connected food hub, based in Whittlesea. Healthy eating and nutrition talk: Friday, 12th April, 11am-midday; Whittlesea Library. What: This session will teach you about healthy habits and how you can get the most out of your meals every day. All participants will receive a free Maggie Beer Foundation recipe booklet. Native fingerlime tasting: Saturday, 13th April, 10am-midday; SEEDs Communal Garden, Brunswick. What: Synti’s Garden will be hosting a native fingerlime tasting alongside the SEEDs Communal Garden Food Swap & Sew. The four new season varieties available are Pink Ice, Red Champagne, Green Crystal and Emerald. Fruit and plants will also be available (no obligation) for purchase to take home. Meet the farmer tour: Sunday, 14th April, 9-10am and again 11-midday; Eltham Farmers’ Market. What: Explore the hidden treasures of Eltham Farmers’ Market on an insider’s tour with local farmer Isy from Sugarloaf Produce. Meet some of the stallholders, hear the story of the farms, how their produce is grown and ask questions. A free Eltham Farmers Market bag is included. Backyard beekeeping with Melbourne City Rooftop Honey and Transition 3081: Sunday, 14th April, 2-4pm; Bellfield Community Garden. What: Learn about what it takes to have a beehive in your backyard, with the team that has helped revive urban beekeeping in Melbourne (Melbourne City Rooftop Honey). As well as the theory on backyard beekeeping, the workshop will also include a hands on inspection of a live hive. Hops master class: Saturday, 27th April, 12.30-2.30pm; 3 Ravens Brewery, Thornbury. What: What you will learn: taste your way through hop-driven beers from The 3 Ravens under the expert guidance of one of their brewery team; see behind the scenes of a fully functioning craft brewery; and learn The 3 Ravens approach to hop-driven beers. What you will get: brewery tour; sharing style feast; and a guided tasting of hoppy beers. Cost: $65 (includes a meal). Recycling your food waste at home: Saturday, 4th May, 10am-midday; Kew Library. What: Nearly half of the waste in our bins consists of food and organics that could easily be composted and turned into nutrient-rich fertiliser for your garden. In this workshop, Maria Ciavarella, from My Green Garden, will talk you through how to set up your own low cost worm farm using recycled materials. Learn about outdoor composting, benchtop (Bokashi) composting and worm farming, as well as how to safely compost pet poo. Kellybrook Cider Festival: Saturday, 4th May and Sunday, 5th May, both 11am-5pm; Kellybrook Winery, Wonga Park. What: Scrumpy cider, live bands and lots of food is what the Kellybrook Cider Festival is all about. Set in the historic gardens and vineyards at Kellybrook’s Wonga Park property, the weekend will feature Kellybrook’s scrumpy and other ciders, beers and wines. There will also be tastings at the cellar door. Bring your picnic rug, invite your friends and celebrate the end of apple harvest. Kalorama Chestnut Festival: Sunday, 5th May, 10am-4pm; Kalorama Memorial Reserve. What: Savour the abundant chestnuts, gourmet food, Devonshire tea, coffee, artisan beer and mulled wine. Explore the diverse range of stalls showcasing locally-made handcrafts and produce. Children can enjoy the fun rides and adventure play space. The activities will include: roasted chestnuts; poffertjes; Devonshire tea and homemade cakes; sausage sizzle; local restaurant food stalls; artisan beer (including chestnut beer!) and mulled wine; coffee, tea and chai; bungy jump trampolines; train rides’ flying swings; petting zoos; old-fashioned kids games; raffles; local handmade crafts; local produce; and live music and performances. How is chocolate made? : Wednesday, 8th May, 7-8pm; Coburg Library. What: Debbie Makin, from Ratio Cocoa Roasters, will teach you about the 10-step, month-long process that goes into making their chocolate bars. Winter vegetable gardening: Sunday, 19th May, at 9.30-11.30am and again at 12.30-2.30pm; Hawthorn Community House. What: Join Maria Ciavarella, from My Green Garden to receive practical tips and advice on soil preparation, winter plant selection and sustainable pest control for a thriving and healthy vegetable crop. You will also have the opportunity to get your hands dirty in a practical planting activity. Bookings: EventBrite (9.30am and 12.30pm). Native herbs for the kitchen and garden: Thursday, 23rd May, 6.30-9pm; Bulleen Art and Garden. What: What you will learn: which native produce-plants are suitable for growing in the Melbourne area; what to harvest and when; and how to use them to flavour your dishes and enliven your garden. Presented by Karen Sutherland, of Edible Eden Design. Explore edible native Australian plants that are easy to grow, attractive and add flavour and interest to your home-cooked dishes. Lemon myrtle, bush pepper and native salt are just a few of the flavours we can smell and taste, and they and many others will be discussed in terms of how best to use and grow them in your garden. All plants covered are suitable for a Melbourne climate, and many are suitable for pot cultivation. Kitchen medicine – the garden farmacy: Sunday, 26th May, 2-4.30pm; CERES, Brunswick East. What: What you will learn: an introduction to herbal medicine making; plant identification; guidelines for foraging and wild-crafting; medicinal uses for plants; and how to introduce medicinal herbs into the kitchen for medicine. What you will get: a remedy and a seedling. Presenter: Lisa Hodge. Take a walk through the CERES garden beds and bring the wisdom of traditional herbal medicines into a modern context. During this workshop, you will explore traditional and modern uses of the plants and how to introduce these plants into the kitchen as medicine. You will make an item to take home as well as a seedling. Smarter living – urban agriculture, cultivating a community discussion panel: Wednesday, 29th May, 7-9pm; Box Hill Town Hall. What: Urban agriculture is the practice of growing, harvesting and cooking food in an urban setting. At the heart of urban agriculture are communities that are come together to develop relationships, share knowledge and build creative partnerships. In this seminar, an expert panel will share their stories and discuss how neighbourhoods can work together to grow food and share harvests. The panelists will include: Paul West – chef turned urban farmer from River Cottage Australia; Michael Mobbs – author of Sustainable Food and urban farm designer; and Ellen Regos – Team Leader for the School Food Gardens Program at Cultivating Community. Edible weeds walk: Saturday, 1st June, 11am-1pm and again at 2pm; Merri Creek Trail. What: What if many of the weeds in our garden were just as edible as the vegetables we tend beside them? What if some of these free, all-too-easy-to-grow uninvited guests were so nutritionally dense that they are just about the healthiest things you could possibly eat? What if many of them also had medical traditions dating back centuries? Well it’s all true! And if you know what to choose, they also taste great. Join Adam Grubb, co-author of The Weed Forager’s Handbook, for a fascinating walk on the wild side, foraging for edible weeds. Bookings: their website (11am and 2pm). Cook Indian by the creek: Friday, 24th May, 6-7.45pm; Diamond Creek. What: Menu: lamb rogan josh with flat bread. Cook Indian by the creek came into existence with the idea of breaking the myth that Indian cooking is complex and difficult to nail. In each session, they will share their traditional recipes and go through the step by step cooking process. The classes are held in a private kitchen. Cooking master class – healthy Winter warmers: Friday, 24th May, 7-9pm; Gourmet Living, Templestowe. What: Enjoy 3 tasting size courses cooked by chef Bek McMillan, from Gourmet Living, who will demonstrate step by step. All recipes are included. Menu: Winter minestrone; spiced chicken medallions; and spiced fruit compote. Fermented beverages: Saturday, 25th May, 10am-midday; CERES, Brunswick East. What: What you will learn: do’s and don’ts of fermenting beverages; and the process of fermenting beverages. What you will get: recipes to take home; a jun scoby to take home; and samples in class of all three beverages. Presenter: Monique Miller. You will learn the basics of fermenting kombucha and jun kvass (a relative of kombucha) at home. Mexican – tortilla making: Saturday, 25th May, 10am-12.30pm; Panton Hill. What: Ana and Gaby are Mexican Aussies with a wealth of skills, knowledge and experience in cooking Mexican dishes. Immerse yourself in Mexican cooking techniques and culture. This workshop will cover making fresh tortillas and tacos y quesadillas. No Waste Cook Club Carlton: Saturday, 25th May, 10am-2pm; Carlton North. What: Learn how to be creative with veggies and more adaptable in the kitchen so you can save money and reduce food waste. Participants will cook and enjoy a delicious vegetarian lunch with others. Free and open to all, with lunch and workshop materials provided. Presented by Open Table. Cook Indian by the creek: Friday, 31st May, 6-7.45pm; Diamond Creek. What: Menu: street food (chaat) + gulaab jamun. Cook Indian by the creek came into existence with the idea of breaking the myth that Indian cooking is complex and difficult to nail. In each session, they will share their traditional recipes and go through the step by step cooking process. The classes are held in a private kitchen. Cooking master class – ‘a British affair’: Friday, 31st May, 7-9pm; Gourmet Living, Templestowe. What: Enjoy 3 tasting size courses cooked by chef Bek McMillan, from Gourmet Living, who will demonstrate step by step. All recipes are included. Menu: healthy Winter root veg soup; beef & red wine stew; and raspberry scones. Meet the farmer tour: Sunday, 14th April, 9-10am; Eltham Farmers’ Market. Meet the farmer tour: Sunday, 14th April, 11-midday; Eltham Farmers’ Market. Introduction to horticulture – 9 session course: every Saturday for 9 weeks, starting 4th May, 9.30am-3pm; Edendale. Kellybrook Cider Festival: Saturday, 4th May, 11am-5pm; Kellybrook Winery, Wonga Park. Home composting workshop: Saturday, 4th May, 2-4.30pm; Edendale. Make your own beeswax wraps with Emma Grace: Sunday, 5th May, 10am-2pm; CERES, Brunswick East. Kellybrook Cider Festival: Sunday, 5th May, 11am-5pm; Kellybrook Winery, Wonga Park. Paul Gale-Baker on wicking beds: Tuesday, 7th May, 7.15-9.15pm; Hurstbridge. French ornamental vegetable gardens: Wednesday, 8th May, 7.30-10pm; Doncaster Garden Club. Vegan brunch cooking class: Monday, 22nd April, midday-4pm; The Beet Retreat, Smiths Gully. No Waste Cook Club: Saturday, 4th May, 10am-midday; North Fitzroy Library. Sourdough bread making workshop: Saturday, 4th May, 10am-1pm; Living & Learning Panton Hill. Mexican – delicious everyday meals: Saturday, 4th May, 10.30am-1pm; Diamond Creek. Miso paste making: Sunday, 5th May, 11am-1.30pm; Preston. ‘Everyday vegan’ cafe style cooking class: Sunday, 5th May, midday-4pm; The Beet Retreat, Smiths Gully. Early Mothers Day high tea (thermomix): Sunday, 5th May, 4-5.30pm; Kilsyth.